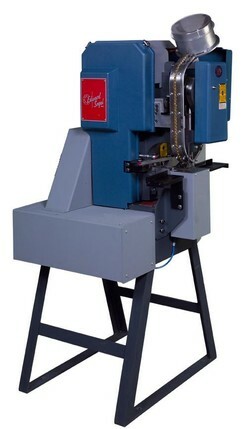 The Edward Segal Inc. Model 92GW is a fully automatic grommet machine that punches a hole in the material and feeds and attaches both the grommet and washer, all in a single cycle. The result is a strong, durable quality setting with greater productivity, all leading to a fast return on investment. The machine was specifically designed for heavy duty industrial fabrics including Kevlar and Nylon. · Increased Productivity: customers report increases in excess of 300% over conventional double revolution grommet machines. · Compensator: to allow variance in material thickness of up to .125". · Stripper Plate: to lift grommet setting off of the pilot of the set die. · Increased Safety: the operator does not have to put fingers in the setting area to load the washer. Dimensions (W x D x H): 36" x 36" x 66"